I put 4dr Exploder springs in mine and during my research found that F150 springs would probably work too but would give more lift than I wanted. While it's not any easier to get these out of a U-pull-it, it was cheaper and I didn't have to cut anything off. If you follow what I did (I don't remember who suggested it, but it's not *mine*), get springs from two different Fords and make sure they're both on the left side. The right side had much, much more corrosion and rust and was so much harder to remove. I swapped in 97-03 F150 springs (4-5" lift) thinking it would be enough. 1982 Wagoneer LTD, Slushbox, I6 w/ 4.0 head, Explorer rear spring, 4.0 timing set/cover and backwards fuel gauge. How many gallons per mile do you make? Proper grammar dictates the question is "may I borrow your BFH?" To which I answer "yes, you may, no take the bigger one, you'll need it". Last edited by smacaroni : 03-28-2012 at 10:46 AM. Ran across this today, thought it might be handy for those thinking of doing this, or some other hanger mod. It will still be a while before I can test the function, as I have ran into some $$$ problems with work slowing down. Still getting the hours to keep bills paid, just got to be VERY mindful of every cent right now. On the good side, I did just trade a 700R4 I had laying around, for a 4L80e. Yep OD trans and doubler should have a gear for every situation now . Hey, that's great. I hope it works out. I did the Exploder spring which wasn't too bad other than I'd suggest buying just the "inside" (for the US market, left) spring from two different vehicles. However, the appeal of walking into any place that sells Dorman parts and saying "I'd like two Dorman 722-010 please" is encouraging. I plan on doing this early next year to get rid of the blocks on the rear axle. What would happen if you used this in conjunction with the BJ's 1.5" shackle lifts front an back and combine it with an existing lift? What would that do to the driveline angles? Would a high steer be needed in the front in addition to a dropped pitman? Last edited by p@55w0rd : 08-03-2012 at 07:13 AM. I plan on doing this early next year to get rid of the blocks on the rear axle. This shackle flip would work well to get rid of 1.5"-2" blocks in the rear, depending how you set it up. Done this way, longer shackles will lift it more now as well. What would happen if you used this in conjunction with the BJ's 1.5" shackle lifts front an back and combine it with an existing lift? The shackle wont care if the springs are stock or lifted. You would gain an extra 1.5" of height. Sounds like a good thing to me, but 1.5" lift shackle would be 3" or so longer than stock. Thats starting to put a lot of leverage/stress on the mounts and frame( think pry-bar). Might be OK, depending on your use. 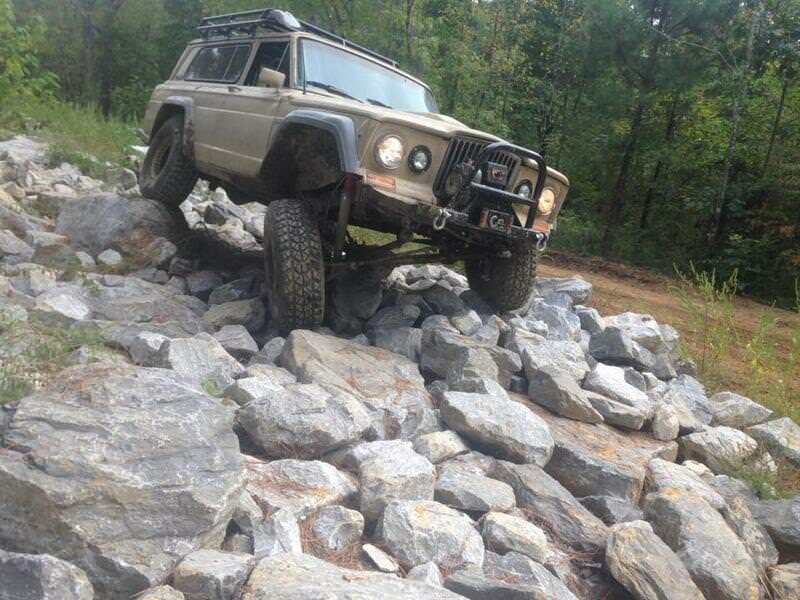 If you plan on beating it on the trail, I would probably stay with a little shorter shackle, like the 1/2" lift or MAYBE the 1" lift ones BJ's sells. I dont care for long shackles for one of the same reasons I dont like blocks. Why give your rig more leverage to tear itself apart? Shackles are a necessary evil (read as "pry-bar"), that I dont like making much worse (longer). That said, they are also one of the easiest parts to use for tuning the action/final ride height (within reason) of leaf spring suspension. What would that do to the driveline angles? Would a high steer be needed in the front in addition to a dropped pitman? Not enough info for me to try and answer that part here. Post up in the off-road section, with your current specs, and what you are thinking of doing. Link this thread so they know what SF you are referring to, and I'm sure everybody will be able to help you figure out the best way to get what you want done. I'm liking this idea. Funny because I had a customer with a ranger come to me with the rear shackle mounts rusted off. Had to replace everything for front and rear springs, but looking at them I said "well, maybe this would work on my truck". Meaning the rear hangers. I did get new GW springs and when I took my existing springs out, I knew they would lower my truck. Think I may have the factory 5+1 springs, new springs are a 4+1. But I do want to get rid of my Rough Country lift blocks. 2" I think and be able to not have to call all over for Ubolts. Guess I need to take some measurements. I may end up with the BJ's 1" shackles just to level out the truck, my front suspension sits a little higher because I have a the RC 2" lift but then had to add a 2" helper spring up front to compensate for my bumper and winch. 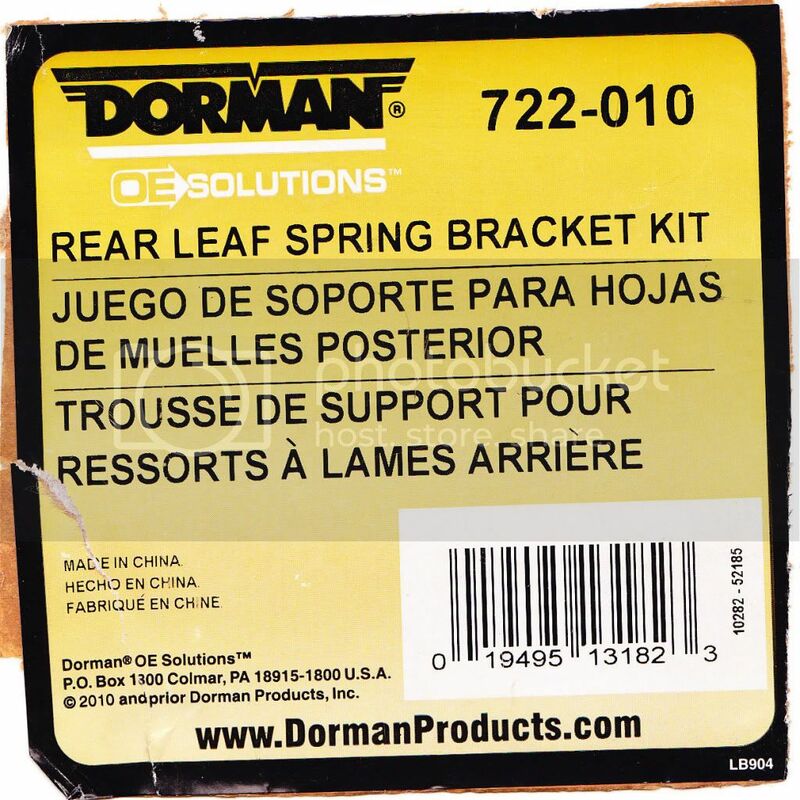 I am very interested in doing this and have ordered the Dorman bracket kits. Crawling under the Waggie last night, I noticed that the exhaust will need to be relocated. Guess this is something I will have to investigate alittle further. Someone talk to me about the Explorer or F150 spring thing. What years fit? How much lift over stock? Bolt in? Do they move the axle position? Different (meteric) bolts and I shaved the front spring bushings with a grinder to make them fit. pick a size, either open up the bushing or use washers welded to the frame to make the holes smaller. I left mine where you have to wiggle and tap them in, dont want them loose. Also, mind the heat you are making when grinding. Dont want to ruin those bushings. I am going to see if I can find some replacement bushings that fit the spring, and have our bolt size later. I used th F150 shackles, so cant speak to how they fit in the stock shackles. I see. So they are just a possibly cheaper option than using the regular stock springs available. I'm happy with the Exploder spring. Yes they bolt in easy enough, I may have had to take the grinder to them slightly, but nothing huge. Axle moves forward a tiny bit, I can't recall off the top of my head, it's not enough to notice once the wheels are mounted. My only piece of advice is if you're buying used springs, take one from the left side of two different vehicles (unless you live in a country that drives on the wrong side of the road, in which case, two right side springs) because the crap that collects on the curb side makes more rust and thus it's more difficult to remove. ETA: get new U-bolts, I got mine bent by a local big rig supplier for $28. I had to turn the bolt that holds the leaf stack around and I would suggest replacing that with a new one as well. IIRC these were $3 ea. Well I'll see. I have a new pair of rear springs, but looking for a bit more flex or softer ride in the rear. I deal with a spring manufacturer directly so prices aren't a concern for new stuff. I thought if the Explorer or F150 had thinner leaves but more of them, I could get a better ride. Then again, I have 2 RC front springs with 2.5 AAL front and rear so I'm sre anything would ride better. But to be honest, my ride is pretty good. All the extra weight helps. Gearing up for an SOA so if anything I would rather the rear axle go back an inch. Just to not cut the door side of the wheel well. I know bupkis about vehicle suspension. Is that what these springs came from? has anyone on here done this? I know this is a way old thread. I got the same hangers used here but they do look pretty weak. I am wondering if anyone has put any miles on this setup with these hangers? Never tried to air out this rig either, I can only imagine it would fly like a brick, and land worse. Rig is currently in rebuild status. These mounts are one of few things that will NOT be changed. thanks for the reply. alright, hopefully next weekend I will be installing them.